Besides on-the-fly conversion to CMYK, Modern PDF Printer adds security to your files with Modern PDF Printer's password features. You can also restrict viewing, printing, editing, or copying of documents to only individuals with the correct password. The PDF documents created with Modern PDF Printer are fully compliant to the Adobe PDF Specification, full-text searchable and totally vector-based. JPEG2000 support is available. 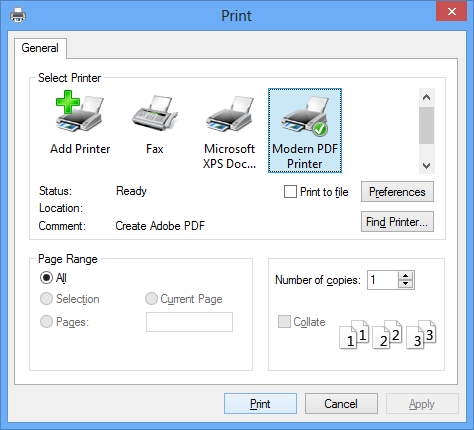 Modern PDF Printer allows you create and optimize PDF output for its intended use. You can make PDF documents for booklet or high resolution for printing with this PDF Printer's powerful Color Space features. You can also embed fonts, if needed, into the PDF document to ensure correct document display across computers. Modern PDF Printer makes the creation of CMYK PDF documents fairly easy. 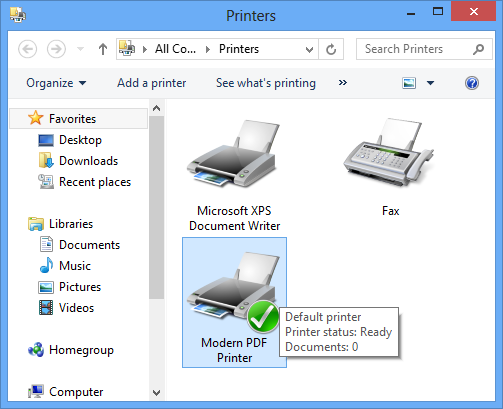 Just print to the ModernPDF printer as you normally print to an inkjet or LaserJet printer, and you will get the CMYK PDF document that you need. The PDF files produced with Modern PDF Printer are 100% compliant to the Adobe PDF Specification and are ultra compressed, full-text searchable and totally vector based.